Virmir-Cards, the deck of playing cards I've been working on mentioned in the chat and around the forums is now available for sale! 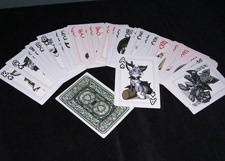 This is a deck of standard playing cards composed of most of the drawings I've posted over the last several months in my various art galleries. You can read more about it and see more pictures at the following link.